Famous for its key role in the Falklands War, the Sea Harrier formed an integral part of Royal Navy fleet air defence from 1981 onwards. After the Falklands War, a Mid-Life Update in the 1990s gave it a new lease of life as a formidable Beyond Visual Range interceptor. The last all-British fighter in service, it’s premature retirement in March 2006 creates a gap in operational capabilities which will leave the Royal Navy without dedicated fighter cover for many years. In 1966 the first of the Royal Navy’s next generation fixed-wing aircraft carriers, the CVA-01, was cancelled by the Labour government. At this time the Royal Navy had two aircraft carriers in service, HMS Ark Royal and HMS Eagle, both of which were expected to end their useful sea life during the 1970s. The Phantoms and Buccaneers, which the Navy had ordered to fly from its carriers, would then have to be passed to the RAF. In future, Royal Navy operations in the North Atlantic and North Sea would have to rely on land-based air cover. Reluctant to accept this situation, in the late 1960s the Admiralty started planning a new class of ship, called Anti-Submarine Cruisers or ‘through-deck’ cruisers, which would carry a small helicopter squadron of 9 or so machines. The small size of the ships, about one-third the tonnage of the CVA-01, would certainly make then affordable. In 1969 the Harrier GR.Mk 1 entered service with the RAF, and in the same year the Admiralty began internal studies of a navalised Harrier. It was soon clear that the V/STOL (Vertical/Short Take-Off and Landing) Harrier would be able to operate from a small carrier deck without the need for any catapult or arrester gear. The idea of adding a multi-role version of the Harrier to the small air wing aboard these new ships quickly gained ground. The aircraft was expected to combine three roles: air interception of long range maritime patrol and ship-based attack aircraft, reconnaissance and sea search, and strike/ground attack against ships and shore targets. Strike in this context meant delivery of a nuclear weapon. 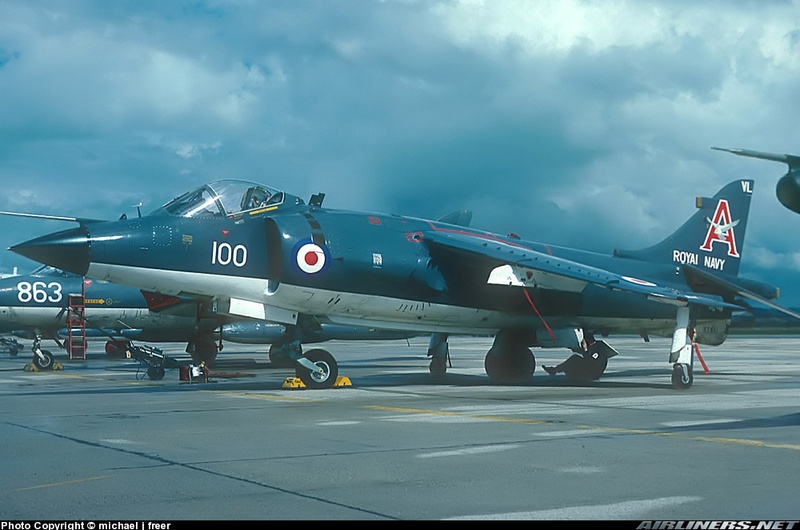 In 1972 Hawker Siddeley at Kingston upon Thames were contracted to study a minimum-change naval derivative of the Harrier GR.Mk 3, to keep costs down. A new forward fuselage was designed, seating the pilot higher to provide space for extra avionics under the cockpit floor and also more room for cockpit controls and displays. The nose would house a low-cost multi-mode radar called Blue Fox, derived from the Ferranti Seaspray used in the Westland Lynx helicopter, while the raised cockpit also gave the pilot a better view. A digital nav/attack system tailored to maritime deployment from ships was introduced, and a different weapons fit developed. Some material changes to the airframe and engine were also proposed to improve sea air corrosion resistance. In April 1973, the first of the new Anti-Submarine cruisers (HMS Invincible) was ordered from Vickers Shipyard. In the same year, Ferranti was instructed to proceed with development of the Blue Fox radar, and Rolls-Royce began work on the Pegasus Mk 104 engine. In May 1975 Hawker Siddeley received a contract to proceed with airframe development and an order for 24 Sea Harrier FRS.Mk 1s was announced. The designation indicating the triple roles of Fighter, Reconnaissance and Strike. A further ten were ordered later, bringing the total to 34. 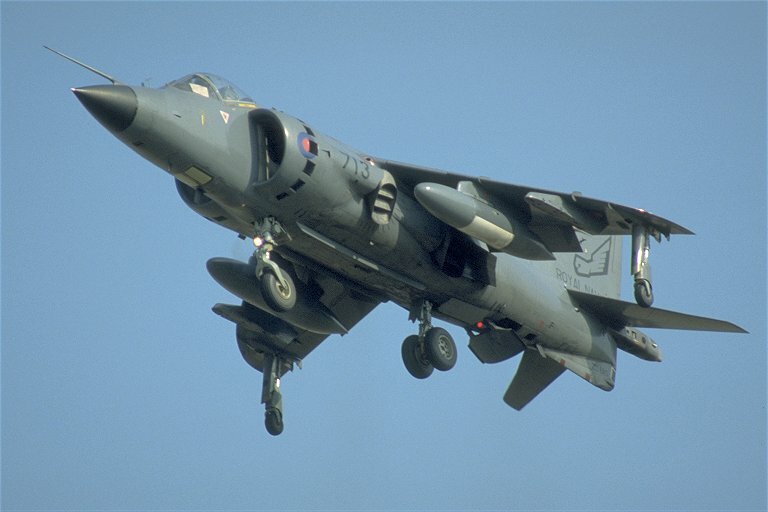 The first Sea Harrier FRS.Mk 1 (XZ450) made its maiden flight at Dunsfold on 20 August 1978, followed by three pre-production aircraft fitted with test instrumentation for development flying (XZ438-XZ440). 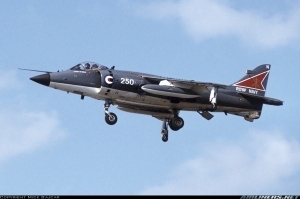 Deliveries to RNAS Yeovilton began on 18 June 1979 with XZ451 being the first to join the Intensive Flying Trials Unit (IFTU), No.700A Squadron. 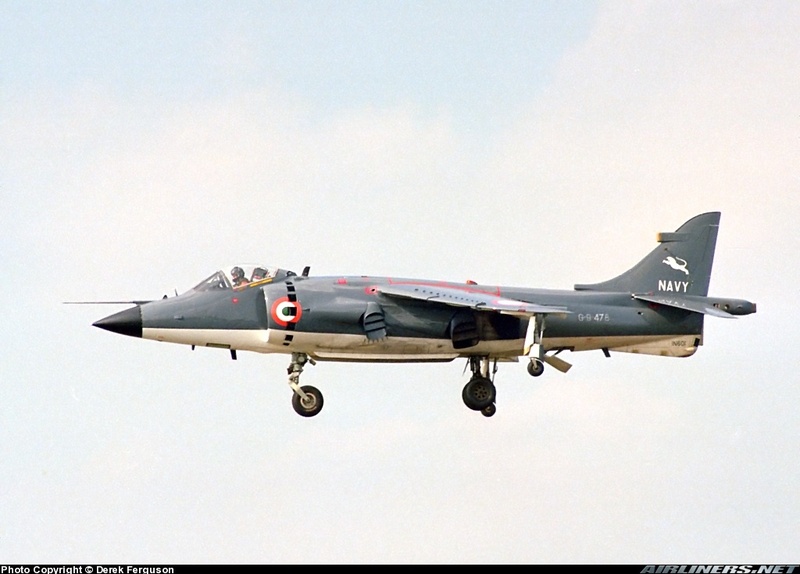 In late 1978 the Indian Navy made the decision to purchase the Sea Harrier, signing a contract in December 1979 for six single-seaters designated Sea Harrier FRS.Mk 51 and two Harrier trainers. 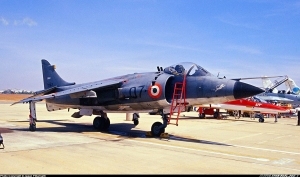 The Indian aircraft differed only in having MATRA R.550 Magic instead of Sidewinder missiles, gaseous oxygen in place of liquid oxygen and minor avionics changes. The first Indian aircraft made it’s maiden flight on 6 August 1982 and deliveries commenced at the end of that year. 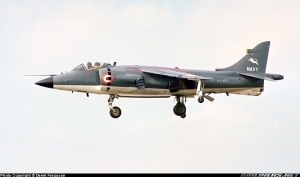 Two additional batches were subsequently acquired, bringing the total to 23 single-seaters, and these aircraft regularly operate from the carriers Vikrant and Viraat (ex HMS Hermes). At the end of March 1980 the Royal Navy Sea Harrier IFTU was redesignated No.899 Sqn, becoming a Headquarters Squadron performing operational training duties, and at the same time No.800 Sqn, the first operational squadron, was formed. No.800 Sqn served briefly on HMS Invincible before transferring to HMS Hermes, an old anti-submarine/command carrier. In January 1981 a second operational unit, No.801 Sqn was commissioned to serve aboard the Invincible. A unique feature of Sea Harrier operations at the time was its ability to launch from a ‘ski-jump’, a ramp fitted in the bow of the ship. First conceived of by a Royal Navy engineering officer, Lt Cdr DR Taylor, placing an inclined ramp at the end of the take-off run launched an aircraft into an upward ballistic trajectory and allowed heavier take-off weights to be flown than would be possible from a flat deck. Flight tests of a prototype ski-jump at RAE Bedford from August 1977, using a development Harrier GR.3, clearly showed that the theoretical benefits would be realised in practice. In September 1977 the Admiralty decided to fit a ski-jump on HMS Invincible, and in 1979 a similar ramp was fitted to Hermes. On 2 April 1982 the military dictatorship in Argentina launched an invasion of the Falkland Islands, to divert attention away from pressing domestic difficulties. Three days later a British carrier battle group sailed from Portsmouth, with a total of twenty Sea Harriers aboard Invincible and Hermes. Whilst on the way, a cache of the latest all-aspect version of the Sidewinder air-air missile, the AIM-9L, was obtained from the USA and flown out to the carriers. The Falkland Islands lay within 600 miles (966 km) of three major Argentinian airbases and the Sea Harriers would thus be vital in protecting the fleet from enemy air attack. 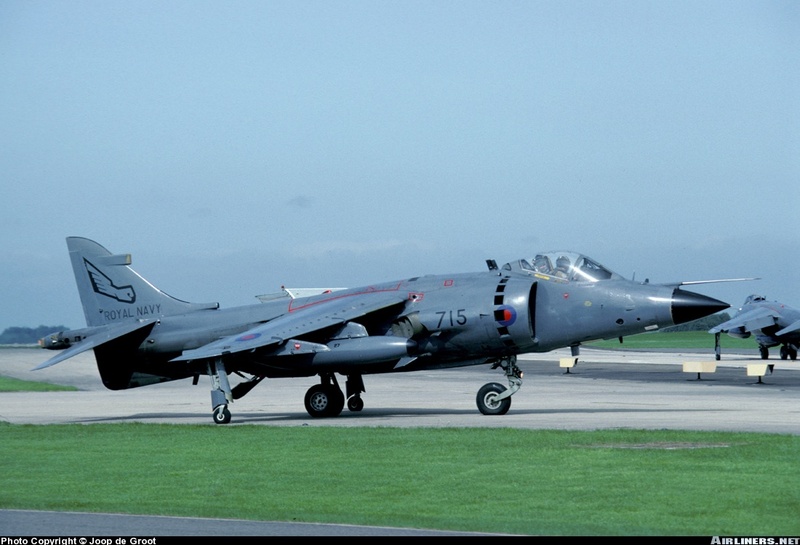 The conflict opened in earnest for the Sea Harriers on 1 May with dawn air attacks on the occupied airfields at Port Stanley and Goose Green. No aircraft were lost. That afternoon Flt Lt Paul Barton of No.801 Sqn (an RAF pilot on an exchange tour) shot down a Mirage 5 with an AIM-9L, scoring the first kill of the conflict and the first for the Sea Harrier. The limited number of fighters available could not provide a complete defensive screen, but the extremely high serviceability of the aircraft, often flying in conditions which would have grounded conventional aircraft, severely disrupted enemy air operations. 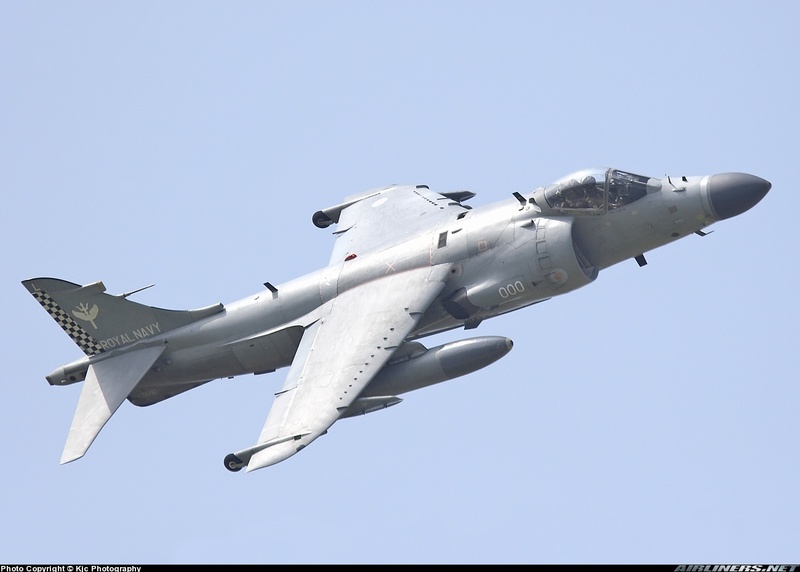 Over the 7 week campaign the Sea Harriers achieved 23 air-air kills in air-air combat for no loss. During the entire war, only two Sea Harriers were lost to ground fire and five more to flying accidents. The humiliating loss of the Falklands War brought about the fall of the military government in Argentina, and the country has been a free democracy ever since. 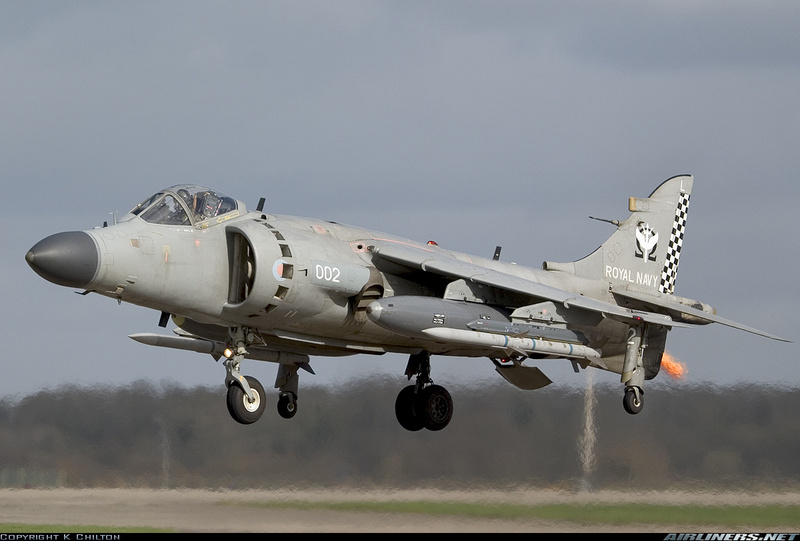 After the conflict, seven replacement and 17 additional Sea Harriers were ordered. 190 Imp gal (865 litre) drop tanks were introduced to improve endurance and twin Sidewinder launch rails were fitted. The Sea Eagle anti-shipping missile was also cleared for use. The remaining two Invincible-class carriers, Illustrious and Ark Royal now entered service as Hermes was retired. At around the same time, it was becoming clear that increasing Soviet carrier air power was beginning to outclass existing Sea Harrier capabilities. Accordingly, a programme was launched to develop the Sea Harrier into a more capable interceptor, while retaining it’s existing strike/attack and reconnaissance capabilities. Known as the Mid-Life Update (MLU), the resulting aircraft was initially designated FRS.Mk 2. In January 1985 British Aerospace received a contract for the project definition phase and conversion of two aircraft to Mk 2 standard. Initial plans anticipated upgrading the entire Sea Harrier fleet, and included more extensive changes, such as wingtip missile rails, but the scope was cut back to rein-in costs. The actual changes incorporated into the aircraft comprised a stretched fuselage with a 13.75 inch (35 cm) plug inserted aft of the wing, a re-contoured nose cone to house a Blue Vixen advanced multi-mode pulse-doppler radar, an improved Radar Warning Receiver (RWR), carriage of AIM-120 AMRAAM Beyond Visual Range (BVR) missiles, and various aerodynamic tweaks including kinking the wing leading edge and moving the dogtooth further towards the root. Other changes included a revised cockpit with new multi-function CRT ‘glass cockpit’ displays and HOTAS controls to reduce pilot workload, and also Pegasus Mk 106 engines – a navalised version of the Mk 105 fitted to the AV-8B. The first of two prototype conversions flew on 19 September 1988. On 7 December 1988 a contract was awarded for the conversion of 29 Sea Harrier FRS.Mk 1 to Mk 2 standard (including the two development aircraft). In January 1994 an order for 18 new-build Sea Harrier Mk 2 and 5 additional Sea Harrier conversions was placed, bringing the total for the Mk 2 to 52 aircraft. Carrier qualification trials were successfully completed in November 1990 aboard HMS Ark Royal. During 1993 and 1994 the Sea Harrier FRS.Mk 1 returned to combat operations, flying a three tours in support of Operation ‘Deny Flight’ over Bosnia. Unfortunately, one aircraft was lost to a SA-7 missile during this period. The pilot ejected and was later picked up. Meanwhile, a series of live firings of the AIM-120 missile from the second development FRS.Mk 2 prototype (XZ439) commenced on 29 March 1993 at Elgin AFB in the USA. In June 1993 an Operational Evaluation Unit (OEU) was formed at Boscombe Down as an off-shoot of No.899 Sqn, to take the aircraft into service. 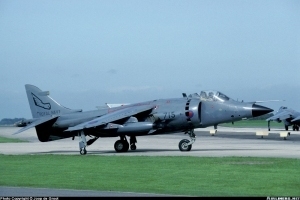 In May 1994 the official designation was changed to Sea Harrier F/A.Mk 2 – indicating a dual Fighter/Attack role. The replacement of ‘Strike’ by ‘Attack’ indicated the formal abandonment of nuclear weapons delivery as an operational role. In September 1994 the F/A.Mk 2 undertook its first operational deployment when four aircraft from the OEU joined HMS Invincible. The F/A.Mk 2 finally replaced the Mk 1 in March 1995 when the last Mk 1 was withdrawn from service. 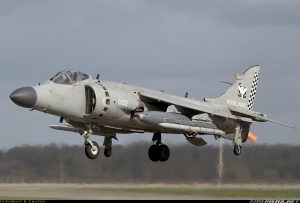 Operation ‘Deliberate Force’ in 1995 saw Sea Harriers once again flying combat operations over Bosnia. 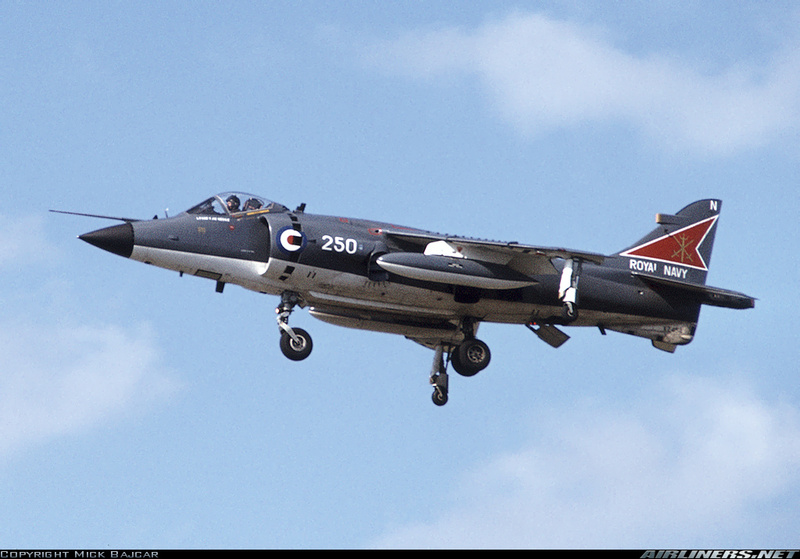 In March 1995 the unusual ‘/’ in the official designation was dropped, becoming Sea Harrier FA.Mk 2. The last new build Sea Harrier was handed over in January 1999. The 1998 Strategic Defence Review included a commitment to consolidate the Royal Navy and RAF Harrier squadrons under a unified command, initially known as Joint Force 2000, (later Joint Force Harrier), to facilitate joint operations of the attack-optimised RAF Harriers and fighter-optimised Navy Sea Harriers, both on land and at sea. Joint Force Harrier was subsequently formed on 1 April 2000. The first challenge for this new organisation came in May 2000 when HMS Illustrious deployed as part of a British military force tasked with restoring order in war ravaged Sierra Leone. 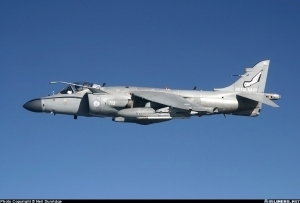 The Sea Harriers provided air support to British ground forces and maintained a very visible deterrent to potential troublemakers. Considering it’s versatility and proven ability, exports of the Sea Harrier were to prove rather disappointing. Potential sales to the Australian and Italian Navies came to nothing, and an FA.Mk 2-style upgrade for India was abandoned in favour of devoting more funding to the navalised LCA. Very soon after entering service the Sea Harrier FA.Mk 2 had begun to acquire a reputation as an outstanding fighter. Thanks to its small size, agility and versatility it was rated by some as the world’s best air combat aircraft. Equipped with an excellent look-down/shoot-down radar and a good BVR missile the Royal Navy had evolved an aircraft which could challenge any fighter then in service. Unfortunately, operations in warmer climates off Africa and in the Middle East had highlighted a sharp drop-off in hover performance with the Mk 106 engine in high air temperatures. This effectively limited the aircraft’s use in hot climates to certain times of the year. With the huge increase in demand for ‘out of area’ operations since 1990, this lack of power was becoming a big handicap. A study to investigate installation of the more powerful Pegasus Mk 107 engine (fitted to late production Harrier GR.Mk 7s) found that significant and expensive structural changes would be required to accommodate the engine. On 28 February 2002 it was announced that the Sea Harrier would be retired, and that Joint Force Harrier would ‘migrate’ to the Harrier GR.Mk 7 and 9 until replacement by the Future Joint Combat Aircraft (Lockheed-Martin F-35 Joint Strike Fighter) in about 2012. On 28 March 2006 the Sea Harrier was formally withdrawn from Royal Navy service when No.801 Sqn decommissioned at RNAS Yeovilton. After nearly 27 years of Sea Harrier service, carrier-based fixed-wing aviation would now only be provided by joint RAF-RN squadrons operating the non-radar equipped ground-attack Harrier. The premature retirement of the Sea Harrier (the youngest airframe was less than 8 years old) is a calculated risk that leaves a yawning gap in fleet air defence until the F-35 finally arrives. As the F-35 programme slips beyond 2012 and new Type 45 anti-aircraft Destroyers are due even later, the Royal Navy has entered a critical period where it is entirely dependent upon it’s allies to provide outer layer air defence. From the South Atlantic to the Adriatic, and beyond, the Sea Harrier has been the fleet’s first line of defence. Now only the Indian Navy continues to fly the type. 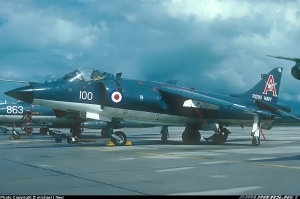 FRS.Mk 1 XZ451 of 700A Sqn in August 1979. Sea Harrier FRS.Mk 1 Initial production version. Navalised multi-role version of Harrier with new forward fuselage and revised avionics. Blue Fox radar in conical nose radome. Pitot probe on nose. Sea Harrier FRS.Mk 2 Initial designation for Mk 2 variant after Mid-Life Update. (Used January 1985-May 1994). Sea Harrier F/A.Mk 2 Interim designation for Mk 2 variant. (Used May 1994-March 1995). Sea Harrier FA.Mk 2 Upgraded version with stretched fuselage, Blue Vixen radar in larger revised radome. Pitot probe on fin. Improved avionics and AIM-120 AAMs. 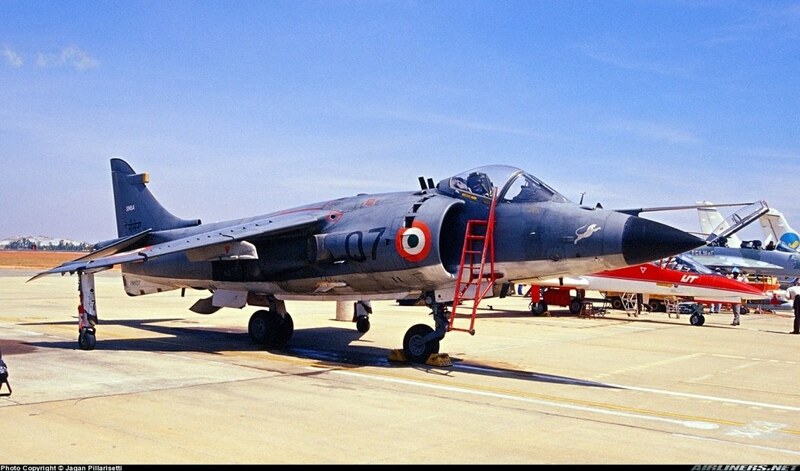 Sea Harrier FRS.Mk 51 Export version of FRS.Mk 1 for Indian Navy. Matra 550 Magic AAMs replace Sidewinders, gaseous oxygen in place of LOX, modified avionics fit. FRS.Mk 1 ZD578 seen at Yeovilton in July 1992. (photo, Joop de Groot-CRMAP) FRS.Mk 1 ZD610 of 899 Sqn at Hurn in 1990. * One squadron was a temporary unit for the Falklands War. Engine(s): One Rolls-Royce Pegasus Mk 104 vectored thrust turbofan of 21,500 lb (9752 kg) st. Performance: Maximum level speed Mach 0.97 (639 kts, 736 mph, 1185 kph) at sea level; Cruising speed Mach 0.80 (459 kts, 528 mph, 850 kph) at 36,000 ft (10,975 m); Initial rate of climb 50,000 ft/min (15240 m/min); Service ceiling 51,000 ft (15,545 m); Combat Radius 400 nm (460 mls, 741 km) on hi-hi-hi interception mission with 4 AAMs, 300 nm (345 mls, 556 km) on hi-lo-hi attack mission. Armament: Underfuselage mounts for two 30-mm ADEN cannon in pods with 150 rpg, one centreline and four underwing hardpoints for up to 8000 lb (3628 kg) for STO and 5000 lb (2268) for VTO. Normal loading – underfuselage and inner wing pylons 2000 lb (907 kg) each, outer wing pylons 650 lb (295 kg) each. Cleared to carry WE177 free-fall nuclear bomb, 1000 lb (454 kg) HE bombs, BAe Sea Eagle ASM, AGM-84 Harpoon ASM etc. Air-to-air armament includes 4 AIM-9L Sidewinders on twin-rail launcher, or MATRA R.550 Magic on Indian Navy aircraft. Engine(s): One Rolls-Royce Pegasus Mk 106 vectored thrust turbofan of 21,750 lb (9865 kg) st.
Armament: Underfuselage mounts for two 30-mm ADEN cannon in pods with 120 rpg, one centreline and four underwing hardpoints for up to 8500 lb (3856 kg) for STO and 5000 lb (2268) for VTO. Normal loading – underfuselage and inner wing pylons 2000 lb (907 kg) each, outer wing pylons 1000 lb (454 kg) each. Cleared to carry WE177 free-fall nuclear bomb, 1000 lb (454 kg) HE bombs, BAe Sea Eagle ASM, AGM-84 Harpoon ASM, BAe ALARM ARM etc. Air-to-air armament includes 4 AIM-120 AMRAAM on fuselage and outer wing pylons, or 4 AIM-9L Sidewinders on twin-rail launchers. Design Office: Hawker Siddeley Aviation Ltd, Kingston upon Thames, London (later British Aerospace plc). FA.Mk 2 Total: 18+34 conv. * Conversion and manufacturing carried out at BAe Kingston-upon-Thames and BAe Brough, East Yorkshire. * Includes arguably the most accurate individual airframe histories for the Sea Harrier. * Very well illustrated history of the development and use of the Sea Harrier. Many colour photos. * First-hand account of the Falklands Air War by the CO of 801 Sqn. * Modellers guide with good close-up photos and markings details. * All-colour pictorial, with many close-up photos. * Includes comprehensive 42-page feature on the Sea Harrier. * Photo report of visit to RNAS Yeovilton in April 2005. See the Aeroguide title listed above.